The comedown from the dynasty years hasn't been kind and the future of the pitching staff likely will follow suit, at least temporarily. Shaun Anderson and Logan Webb were both worthy of midseason steps forward last year. Anderson finished with a 3.69 ERA over 141 1/3 innings, while Webb sported a 2.41 mark over 104 2/3 frames. But there's an interesting collection of raw tools within the system that needs time to develop. Despite some ugly results, Melvin Adon possesses an elite fastball, while 6-foot-11 Sean Hjelle can snap off a plus curveball. Emerging from last year's group was 28-year-old Ray Black, who bulled his way to the Major League 'pen with an 80-grade fastball. The Cubs possess an experienced and expensive starting staff, but the next wave hasn't shown it's capable of filling rapidly approaching Major League gaps. Adbert Alzolay was recently shut down at Spring Training, still battling a strained lat that halted an already difficult 2018 season after eight starts. Cory Abbott showed promise with a 2.50 ERA over 115 innings at Class A Advanced Myrtle Beach and Dillon Maples earned his place in the big league bullpen with 75 punchouts over 38 2/3 innings in the Minors. Alex Lange, a workhorse at LSU before being drafted 30th overall in 2017, saw his velocity dip but posted a respectable 3.74 ERA in 23 Carolina League starts. Milwaukee's hitting-rich system contains some pitching standouts but lacks depth. Zack Brown led a decent rotation at Double-A Biloxi with a 2.40 ERA and .210 opponents' batting average over 127 2/3 innings. Trey Supak posted a 2.91 ERA in his final 16 starts in Biloxi, but Marcos Diplan took a step back and Cody Ponce was plagued by injury during a challenging season. Fortunately, the Brewers have time to find standouts at the lower levels -- Aaron Ashby and Dylan File both showed promise at Class A Wisconsin -- as Jhoulys Chacin and Matt Albers are the only pitchers not under team control through 2020. The World Series champs have a strong Major League rotation, which should allow a rather young system to develop. Granted, established Minor Leaguers Darwinzon Hernandez and Mike Shawaryn both produced strong 2018 campaigns. But the true gems were Denyi Reyes, Jhonathan Diaz and Bryan Mata, three young arms who pitched no higher than Class A Advanced Salem. Reyes posted the most glaring numbers, sporting a 1.97 ERA over 155 2/3 total innings after an August promotion. Unafraid to dip down into the Minors to make their bullpen-by-committee work during their championship run, Travis Lakins and Bobby Poyner are likely the best candidates to fill that role should the Sox revisit that strategy. Franklyn Kilome is the latest in a revolving door of top Mets pitching prospects likely to miss a season to Tommy John surgery. Jordan Humphreys and Thomas Szapucki sat out last year, while Anthony Kay returned to the mound with a 4.26 ERA and 123 strikeouts over 122 2/3 innings across two levels. David Peterson quickly moved up to Class A Advanced St. Lucie in his first full season, posting a 3.16 ERA in 128 innings, while 2018 second-rounder Simeon Woods-Richardson impressed in a short sample in Rookie ball. There isn't a great emergency starter with prospect status remaining who's ready to help an extraordinarily talented but injury-prone rotation. Drew Gagnon led the organization with 172 strikeouts, but he's 29 with just one Major League start under his belt. The Nationals have their entire Major League staff -- starters and bullpen -- under team control through at least 2020, allowing some time for prospects to develop. 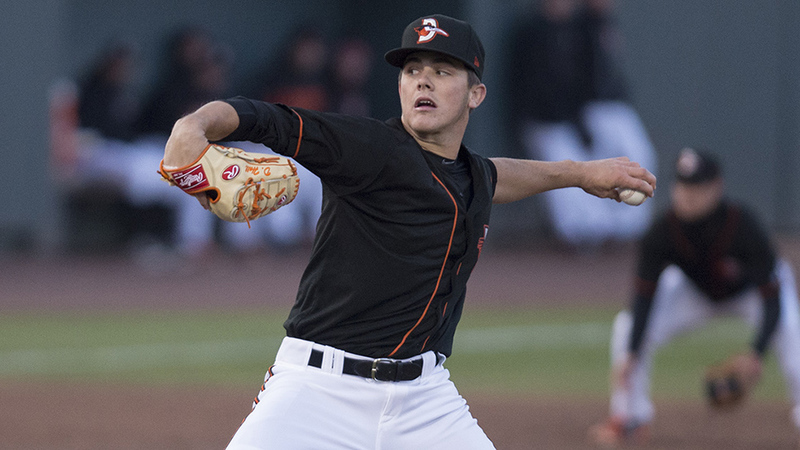 Wil Crowe had a great start with Class A Advanced Potomac, rattling off an 11-0 record, but was knocked back onto his heels at Double-A Harrisburg, surrendering 18 runs over 26 1/3 innings. The often-troubled Seth Romero is likely to sit out the season following Tommy John surgery, but 19-year-old Mason Denaburg is set to make his professional debut this year. Ben Braymer struck out 118 over 114 2/3 innings, mostly as a piggyback starter. Sterling Sharp remained consistent after reaching Harrisburg, finishing with a 3.70 ERA in 148 1/3 innings. The Rockies have the horses at the Minor League level to maintain a quality bullpen well beyond the life of the multi-year deals paid to relievers last season. Matt Pierpont proved he's ready to move on after three seasons at Double-A Hartford, converting 32 of 34 save chances while compiling a 1.95 ERA over 60 innings. Reid Humphreys managed a 2.03 ERA with 58 K's in 40 innings, while Justin Lawrence struck out 62 over 54 1/3 innings and held opponents to a .188 average. No. 3 prospect Peter Lambert struggled at Triple-A Albuquerque after 15 impressive starts for Hartford, and first-rounder Ryan Rolison had a 1.86 ERA in nine Pioneer League starts. Riley Pint was held back by a forearm injury and threw only 8 1/3 innings all year. Griffin Canning's meteoric rise from the California League to Triple-A Salt Lake elevates a pitching staff that's relatively thin from top to bottom, particularly without the services of Shohei Ohtani for the foreseeable future. MLB.com's No. 63 overall prospect made 25 starts across three levels, compiling a 3.65 ERA and 125 strikeouts in 113 1/3 innings. Jose Suarez made the same jump and led the organization with 142 strikeouts. Patrick Sandoval, the Halos' return in the Martin Maldonado deal with Houston, maintained his success in the new organization, finishing with a 2.06 ERA and 145 strikeouts over 122 1/3 frames. Eighteen-year-old William English is set to make his pro debut as a two-way player this season. MLB.com's No. 73 overall prospect, Jon Duplantier, and 83rd-ranked Taylor Widener are right-handers at Double-A Jackson who very soon could fill out the D-backs' big league rotation. Duplantier remained consistent, despite a biceps injury that limited him to 74 innings. He posted a 2.55 ERA and held opponents to a .215 average. Widener proved to be a workhorse, compiling a 2.75 ERA with 176 strikeouts in 137 1/3 innings. Emilio Vargas finished an incredible season at Double-A, posting a 2.88 ERA and 170 strikeouts over 143 2/3 innings. Fellow right-hander Taylor Clarke also ate valuable innings, sporting a 4.03 ERA in 152 frames. Jimmie Sherfy and Yoan Lopez still have prospect status after stomping through the Minors to the Arizona bullpen a year ago. The Orioles likely made the correct decision to rebuild and benefited from an influx of young arms from outside the organization. Dillon Tate and Dean Kremer were the headlining pitchers in two separate trades. Tate struggled with his new club at Double-A Bowie, while Kremer finished off a breakout season with 178 punchouts and a 2.88 ERA. No. 90 overall prospect DL Hall represented some of the brilliant homegrown talent, registering a 2.10 ERA and 100 strikeouts over 94 1/3 innings with Class A Delmarva. No. 11 overall Draft pick Grayson Rodriguez proved to be stingy in 19 1/3 innings in the Rookie-level Gulf Coast League, while southpaw Zac Lowther and right-hander Brenan Hanifee both posted ERAs below 3.00.